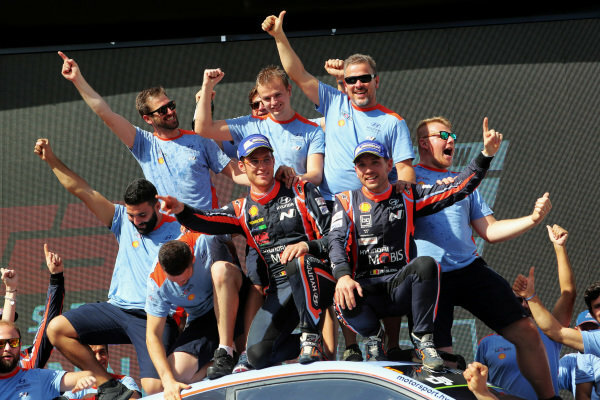 Rally winners Thierry Neuville (BEL) / Nicolas Gilsoul (BEL), Hyundai Motorsport WRC celebrate on the podium with the team at World Rally Championship, Rd13, Rally Australia, Day Three, Coffs Harbour, New South Wales, Australia, 19 November 2017. 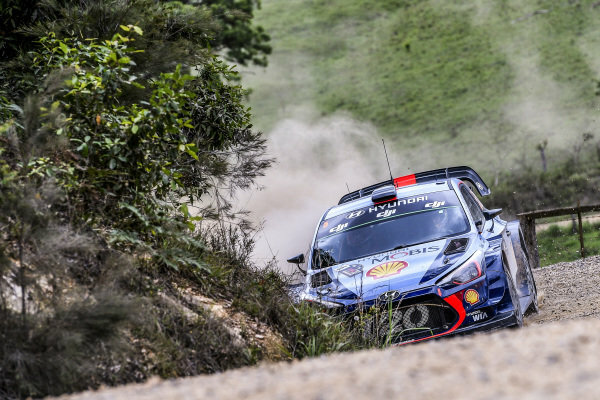 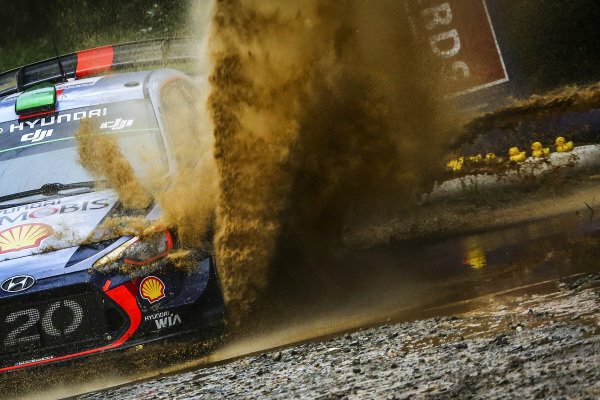 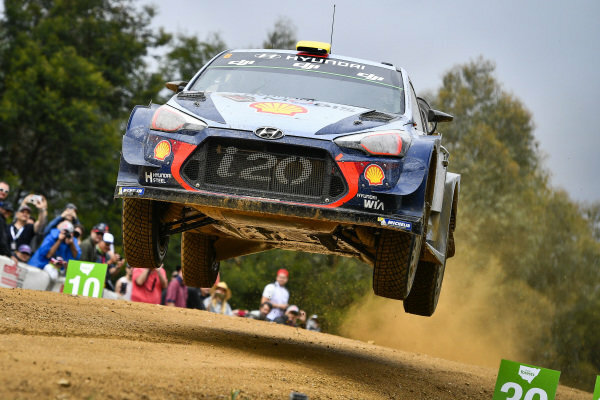 Thierry Neuville (BEL), Hyundai Motorsport WRC at World Rally Championship, Rd13, Rally Australia, Day Three, Coffs Harbour, New South Wales, Australia, 19 November 2017. 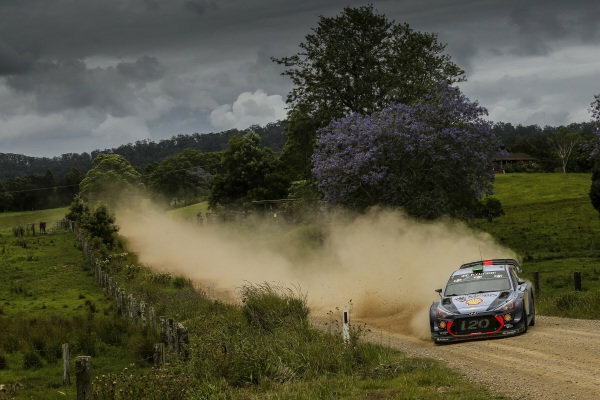 Hayden Paddon (NZL) / Sebastian Marshall (GBR), Hyundai Motorsport i20 Coupe WRC at World Rally Championship, Rd13, Rally Australia, Day Three, Coffs Harbour, New South Wales, Australia, 19 November 2017. 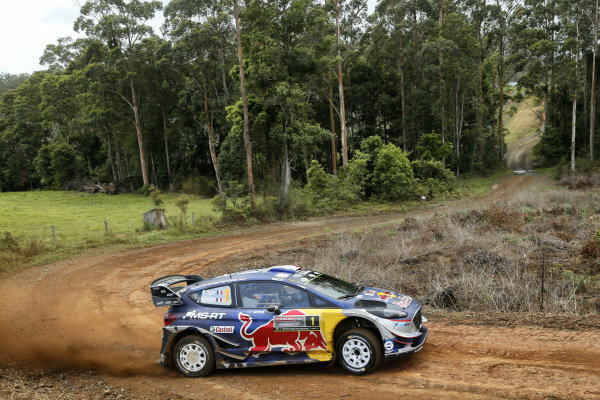 Sebastien Ogier (FRA) / Julien Ingrassia (FRA), M-Sport World Rally Team Ford Fiesta WRC at World Rally Championship, Rd13, Rally Australia, Day Three, Coffs Harbour, New South Wales, Australia, 19 November 2017. 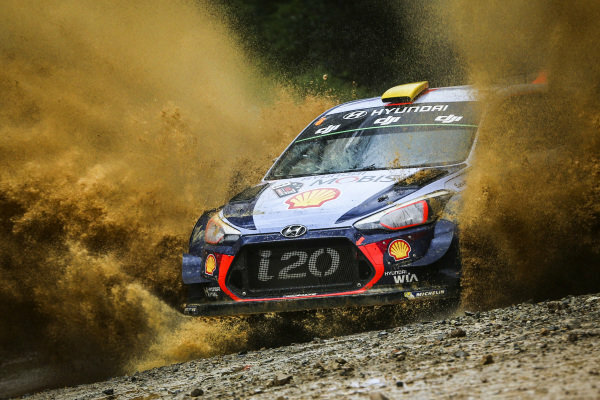 Thierry Neuville (BEL) / Nicolas Gilsoul (BEL), Hyundai Motorsport i20 Coupe WRC at World Rally Championship, Rd13, Rally Australia, Day Three, Coffs Harbour, New South Wales, Australia, 19 November 2017. 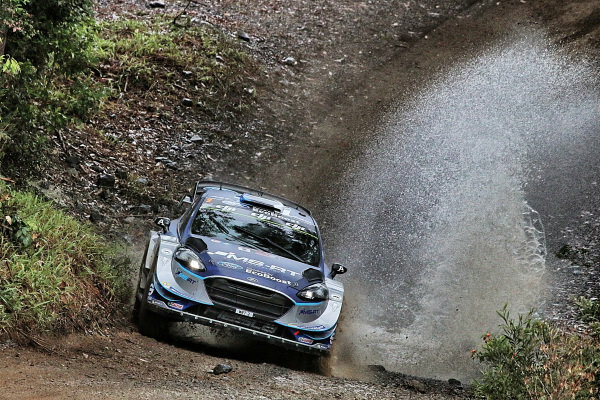 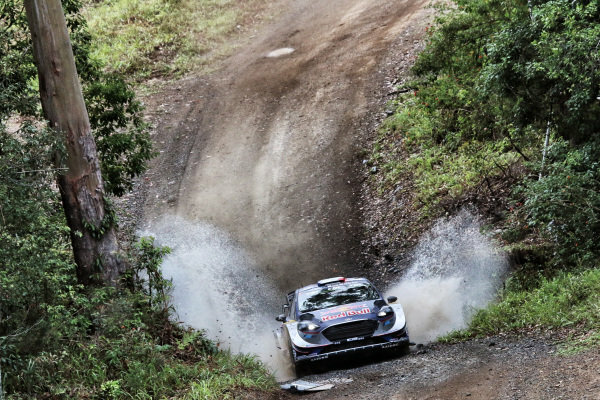 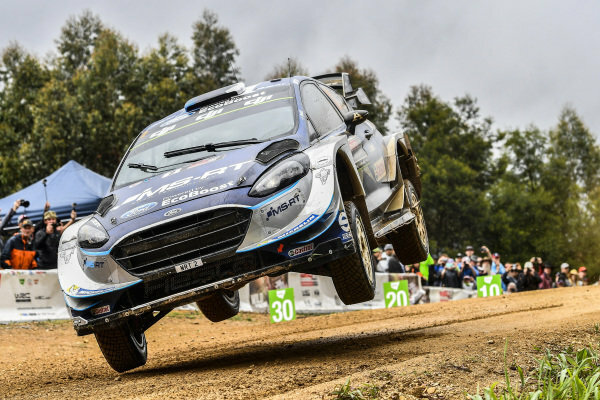 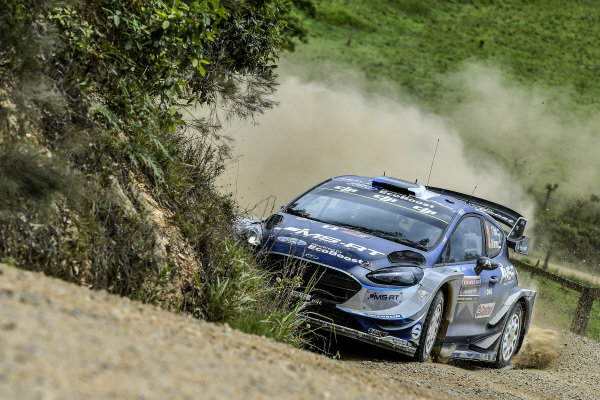 Ott Tanak (EST) / Martin Jarveoja (EST), M-Sport World Rally Team Ford Fiesta WRC at World Rally Championship, Rd13, Rally Australia, Day Three, Coffs Harbour, New South Wales, Australia, 19 November 2017. 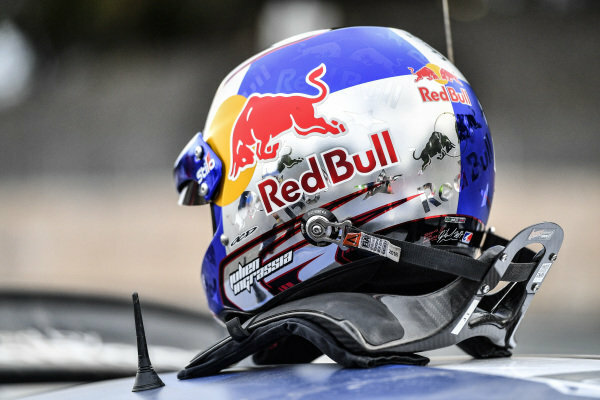 The helmet of Julien Ingrassia (FRA), M-Sport World Rally Team WRC at World Rally Championship, Rd13, Rally Australia, Day Three, Coffs Harbour, New South Wales, Australia, 19 November 2017. 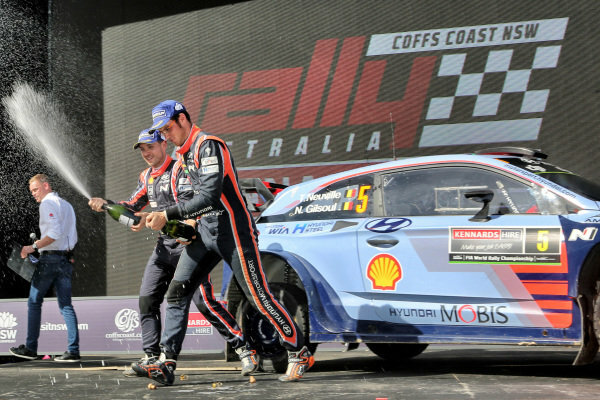 Rally winners Thierry Neuville (BEL) / Nicolas Gilsoul (BEL), Hyundai Motorsport i20 Coupe WRC celebrate on the podium with the champagne at World Rally Championship, Rd13, Rally Australia, Day Three, Coffs Harbour, New South Wales, Australia, 19 November 2017. 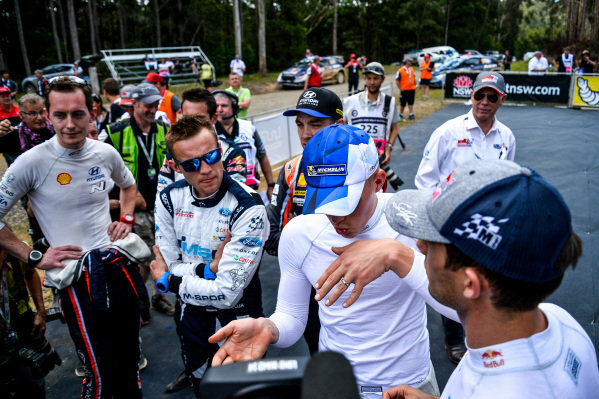 Ott Tanak (EST) / Martin Jarveoja (EST), M-Sport World Rally Team WRC and Sebastien Ogier (FRA), M-Sport World Rally Team WRC at World Rally Championship, Rd13, Rally Australia, Day Three, Coffs Harbour, New South Wales, Australia, 19 November 2017. 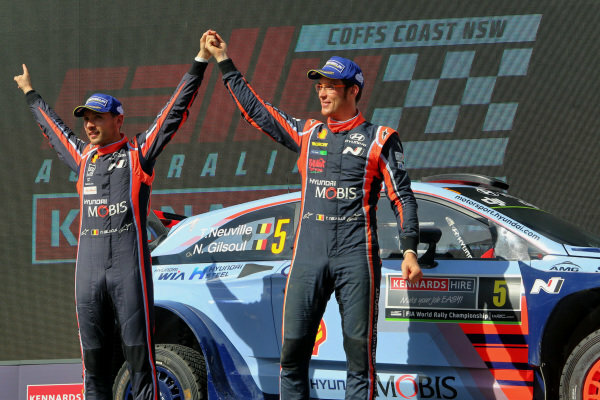 Andreas Mikkelsen (NOR) / Anders Jaeger-Synnevaag (NOR), Hyundai Motorsport Hyundai i20 Coupe WRC at World Rally Championship, Rd13, Rally Australia, Day Three, Coffs Harbour, New South Wales, Australia, 19 November 2017. 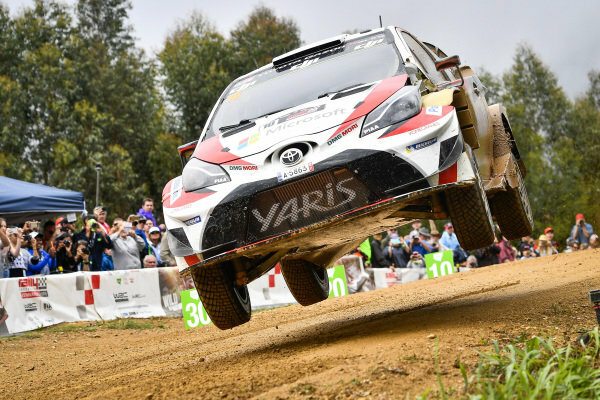 Jari-Matti Latvala (FIN) / Miikka Anttila (FIN), Toyota Gazoo Racing Toyota Yaris WRC at World Rally Championship, Rd13, Rally Australia, Day Three, Coffs Harbour, New South Wales, Australia, 19 November 2017. 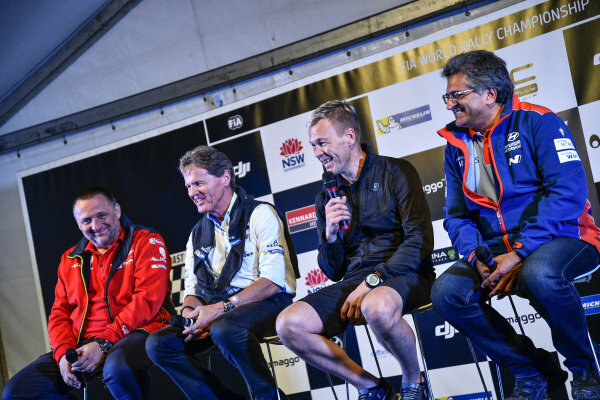 Yves Matton (FRA) Citroen Team Principal, Malcolm Wilson (GBR) M-Sport Boss and Michel Nandan (MON) Hyundai WRC Team Boss at World Rally Championship, Rd13, Rally Australia, Day Three, Coffs Harbour, New South Wales, Australia, 19 November 2017. 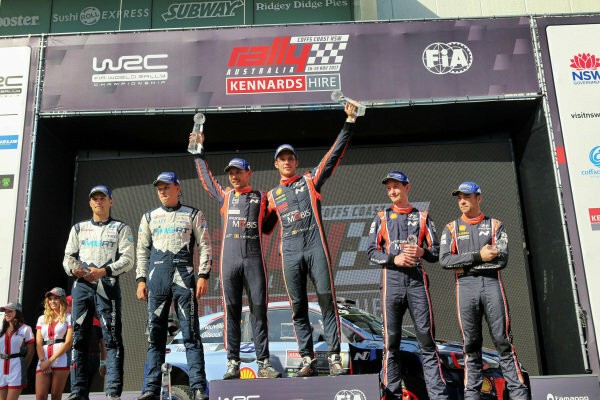 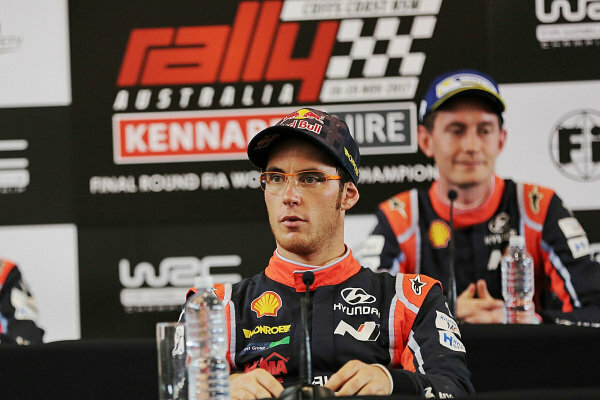 Rally winners Thierry Neuville (BEL) / Nicolas Gilsoul (BEL), Hyundai Motorsport i20 Coupe WRC celebrate on the podium at World Rally Championship, Rd13, Rally Australia, Day Three, Coffs Harbour, New South Wales, Australia, 19 November 2017. 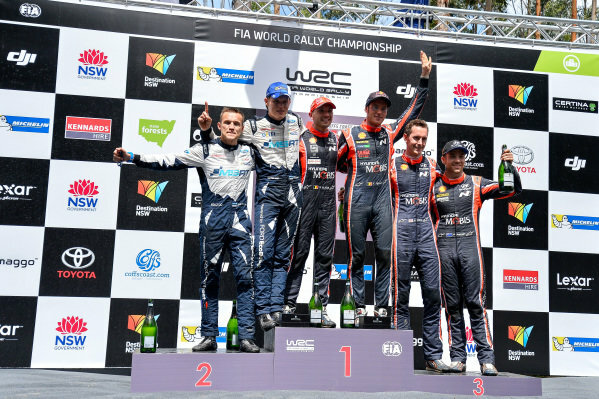 (L to R): Second placed Ott Tanak (EST) / Martin Jarveoja (EST), M-Sport World Rally Team WRC, rally winners Thierry Neuville (BEL) / Nicolas Gilsoul (BEL), Hyundai Motorsport WRC and third placed Hayden Paddon (NZL) / Sebastian Marshall (GBR), Hyundai Motorsport WRC celebrate on the podium at World Rally Championship, Rd13, Rally Australia, Day Three, Coffs Harbour, New South Wales, Australia, 19 November 2017. 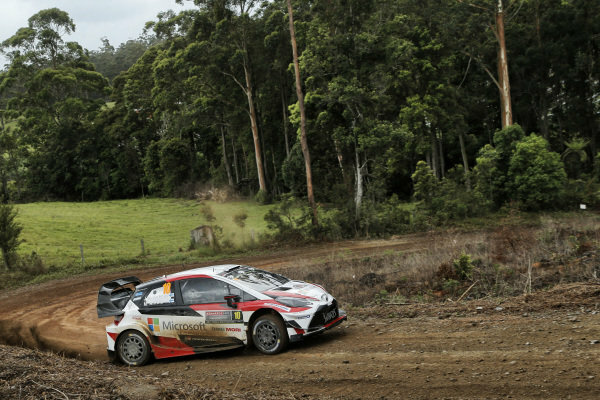 Esapekka Lappi (FIN) / Janne Ferm (FIN), Toyota Gazoo Racing WRT Toyota Yaris WRC at World Rally Championship, Rd13, Rally Australia, Day Three, Coffs Harbour, New South Wales, Australia, 19 November 2017. 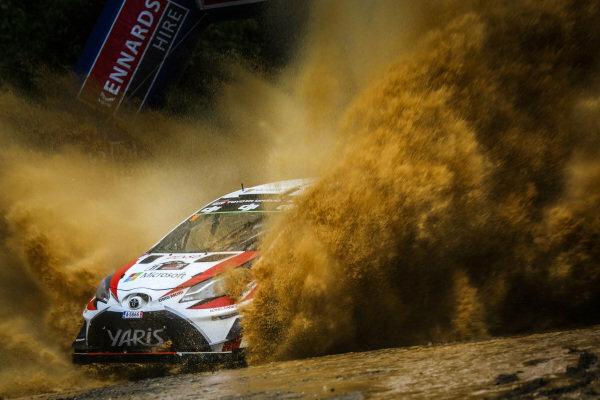 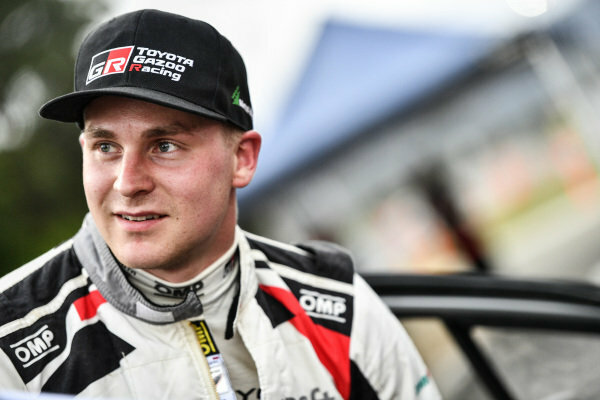 Esapekka Lappi (FIN), Toyota Gazoo Racing WRT WRC at World Rally Championship, Rd13, Rally Australia, Day Three, Coffs Harbour, New South Wales, Australia, 19 November 2017. 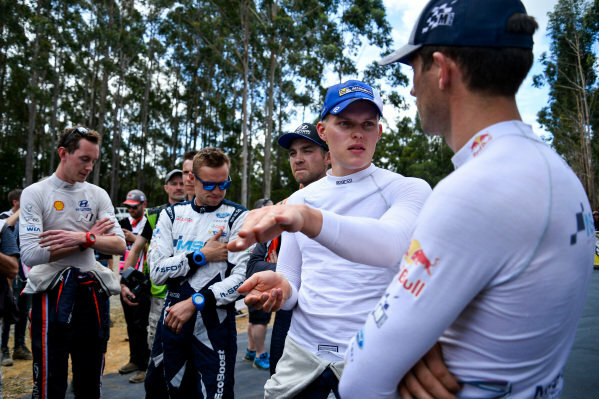 Ott Tanak (EST), M-Sport World Rally Team WRC and Sebastien Ogier (FRA), M-Sport World Rally Team WRC at World Rally Championship, Rd13, Rally Australia, Day Three, Coffs Harbour, New South Wales, Australia, 19 November 2017.